This has to be one of the easiest side dishes ever. And frugal to boot! My husband grew up eating this creamy, comforting dish, so I was first introduced to it after I married into the family. And honestly, I never really cared for rice until I tried it served like this. It’s a stick-to-your-ribs kind of side that can be served all year round. You can serve it alongside roast in the winter, or grilled chicken in the summer. 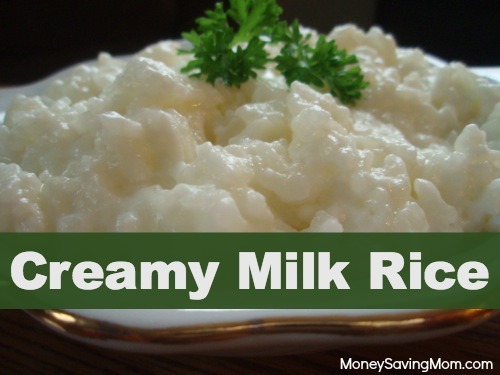 I’ve yet to meet another family who has heard of “milk rice,” so I’m curious if we’re the only family out there!? It falls somewhere between creamy mashed potatoes and risotto. Since it doesn’t have a strong flavor, it pairs well with spicy or barbequed meats. And for those of you who prefer more flavor – feel free to liven this up however you like! Fresh herbs or Parmesan cheese, anyone? If you feel like you’re stuck in a potatoes rut, here’s a super simple recipe to switch it up a little! Stir together rice, milk and salt in a saucepan. Immediately turn heat down to low. Cook uncovered over low heat, stirring occasionally until mixture gets thick and creamy (somewhere around 25-30 minutes – the exact time depends on what kind of rice you use and how hot your stove cooks). Stir in butter and serve! Note: This will continue to get thicker as it cools. I usually take it off the heat when it is just a little bit soupier than I want it to be. If it gets too thick, you can always stir in a little additional milk. Have you ever made “Milk Rice”? I grew up eating “milk rice”, but we called it sweet rice. We would have this for breakfast with sugar. Yes…we called it sweet rice too! 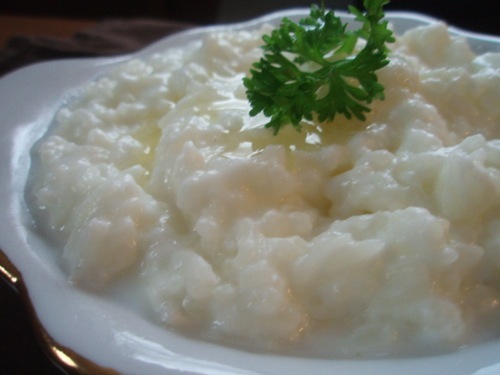 Creamy milk rice is different from sweet rice, rice pudding, or dry,flaky rice. We usually had it for breakfast with country ham, eggs, and red eye gravy. I bet this would be really good with coconut milk, too. It IS good with coconut milk! It’s not the same, but it’s good in a slightly different way. 🙂 I’ve made it like that for myself a few times recently (dealing with some recently diagnosed food allergies). Same here! Was going to say the same. We used milk, butter and sugar! We grew up eating rice pudding for special occasions and it is very similar. We’d serve it with sweet cranberry sauce though for dessert. One of my kiddos favorite breakfasts is regular old leftover rice with milk and sugar. I bet they would love this! I’ve made it before with coconut milk – SO yummy. It’s more like a dessert at that point, and great with fresh mango or other fruit! We would also have leftover rice with milk and cinnamon when I was growing up. This recipe sounds really good and could be adapted to make it more like India rice putting by adding caradmon pods to it while cooking. LOVE Indian rice pudding! This recipe has been handed down at least 3 generations. My grandma (and all of us) always added sugar so that it was more like a rice pudding. Yummy! We grew up eating milk rice with sugar. My mom would make it for us when we were sick. I haven’t thought of it in years, my son is sick today, I may have to make it. I have not head of milk rice, but when I was little my mom served peas in milk and we sometimes ate jello with cream poured over it. Interesting! Do you still eat those things? No, not since I grew up and moved out on my own. I like whipped cream on jello, but not liquid cream and my peas I eat plain. They are just memories of my childhood and my mom now. More precious, because I lost her just about two weeks ago. I’m so sorry for your loss and can’t imagine how devastating that must be. I am so glad you have happy memories to cherish, though. I grew up with my Dad cooking peas and milk together. I always cook my peas that way. I have never met anyone that knows about peas and milk. I always thought it was a new England thing. I grew up in Maine. My mom was from Rochester NY, half Irish and half Cuban. My dad is from AL. I think it comes from my mothers side though, I never thought to ask. My grandmother always made “creamed peas” with new green peas from the garden in spring, and a white milky/cream sauce. It was delicious – I haven’t thought about it in years! Do you put sugar on it? While it would definitely be good that way, we don’t eat it like that. Just curious, because alot of those commenting that make this add sweetener. My dad, who grew up very poor, had this often and still while I was growing up it was a favorite of his. He put cinnamon in it. My grandma would serve “arroz de leche”, as a sweet treat/dessert. She made it with water and one can of evaporated milk, sugar and cinnamon sticks with powdered cinnamon sprinkled on top. Delicious! I’ve never seen it served as a side, but I think my kids would love it too. Yessel, as someone who grew up not liking rice “pudding”, I have to say your grandma’s recipe sounds divine!!! I grew up eating “arroz con leche” as well. You can make it thicker like pudding but we always preferred it nice and milky almost drinkable. I make it now with Almond milk. It really IS a comfort food. We had rice and raisin with sugar and milk for special breakfasts. I’ve never heard of milk rice as a side dish before. I grew up eating a hot cereal type dish. Very similar to some that posted above. We don’t have a recipe written down, but has been handed down for many generations, in fact I just made it and posted it on my Instagram & hash tagged it #ComfortFood I boil water w/ cinnamon sticks, then I sweetened it with brown sugar until it is sweet to my liking. I add rice and when it is cooked, I add milk and sprinkle cinnamon and add a tad of butter. It is milky, cinnamony & sweet. It is mostly eaten as a breakfast hot cereal but we eat it for dinner sometimes on cold evenings. I love it & all my kids love it too! I love my rice cooker…wonder if I could toss these ingredients into it and if it would work? I made sweet rice with coconut milk in my rice cooker and it was divine! I did however, add the milk at the end. Don’t worry, you’re not the only family that makes this. 🙂 Growing up, my family called it ‘Sweet Rice’ because Mama always added a bit of cinnamon and sugar. It is a common dish among the Hispanic population (Arroz con Leche) and they often add a bit of vanilla extract or even a dash of rum! 😀 It probably depends on where you live. I’m in Texas–large Hispanic population–so I would say its a common dish here. Brandi, that’s where I’m from & I agree, a very popular dish in Texas. We never added the rum where I’m from though…lol. I also grew up eating sweet rice. We had it with milk, cinnamon and sugar. Not only was it a frugal breakfast, but it was very good. I don’t remember ever getting tired of it. I grew up eating milky rice and not realizing that all rice is not milky! My husband could never understand why we had milky rice when he would visit my family. It is so warm and creamy and is a nice change from regular rice that we often serve. Yay! Another person who knows what I’m talking about. 🙂 Totally agree with you! I get to eat this at pooja(religious cermony for hindus’) but we add sugar and raisins to our milk rice however it’s called Kheer. If anybody has indian friends ask them about the sweet rice they’ll let you know of other ingredients you can add to it. So it’s a traditional dish, too? Very cool! We ate this growing up. We at rice almost everyday. We called it “Sugar Rice” we would add sugar to it, and eat it for snack, or breakfast with eggs and sausage. I also make this when my kids arent feeling well, I can always get them to eat rice! I often make something similar, only I use a can of coconut milk (tastes best with coconut milk from a can, not the tetra or refrigerated stuff) and 2 cups of water along with 2 cups of Goya medium grain rice. This goes great with anything with fruit – such as Waikiki Meatballs, Orange Chicken, Pineapples and Chicken. Kheer is a type of milk rice with spices such as whole cloves, cinnamon stick, cardamom all boiled together and sugar added at the end. This recipe comes from South East Asia. I feel like my life has changed for the better after seeing this recipe! Can’t wait to try it with coconut milk. I sometimes serve leftover rice with milk and a little cinnamon-sugar to my kids for breakfast; but simmering rice in milk sounds divine. Thanks so much for sharing! I’ve heard of milk rice, but what we actually used to have once in a while is “milk mush” which is hot milk that has been thickened with flour. We would eat it is as a meal and put cinnamon, sugar, and butter on it. (I am a good Scandanavian!) The best though was if there were leftovers – the next day mom would slice the cold mush and crispy fry it in a pan for breakfast! A good Scandinavian chiming in here too! We grew up eating something called Rice Mush, which sounds very similar to your milk mush. It was thickened rice that we would put cinnamon, sugar, butter, and milk on, and then eat warm. We also had Rice Pudding on special occasions which is one of my favorite dishes ever! Sounds interesting! Is the rice pre-cooked, or raw grains? I´m from Austria and milk rice is eaten a lot here! It is often served as a quick easy light meal with jam, honey, stewed fruit or cocoa powder and sugar. Such a comfort food! Growing up we had this staple for supper, but cooked with raisins in it and topped with a generous spoonful of brown sugar! I’m wondering if this could be made with brown rice. I have a giant bag of brown rice in my pantry but no white rice! Oh! This brings back memories! I lived in Russia for five months as an exchange student and we would eat this for breakfast or a light lunch there. It was always put in the “kasha” category (the Russian word for porridge – Russians have lots of porridges). I loved it, and now that you’ve brought it to my mind I’m going to have to make some! I’m learning there are variations of this dish all over the world! Very cool. 🙂 My husband lived in Russia short-term, so I’ll have to ask him if he remembers eating this type of thing there. Thank you for your recipe! It brings back some sweet memories. Growing up in Germany, my mother made a similar milk rice dish when I was a child. I grew up thinking the only way you could eat rice was in a bowl with milk and brown sugar or Rice-a-Roni (gag!). When I married my husband I was introduced to salted, buttered rice and thickened chicken broth on rice. I don’t believe I have eaten it in milk since I got married 21 years ago. I may try this recipe. It sounds good! I grew up eating sweetened white rice. And my hubs & sons love it today. We do minute rice in the microwave, then add butter, sugar & milk when it’s finished cooking. Super quick breakfast meal … or snack. Europeans eat milk rice (my mom is from Germany). But we always had it like a breakfast cereal — a little more soupy — and with butter and sugar. This sounds really good! I will have to try it! I love rice pudding, but never thought of making a similar dish to go with savory foods. Thank you for sharing this idea! And as a bonus, it’s frugal, too. You’re welcome! Hope you like it. Looks great, Bridgette! Sorry about the food allergies. I haven’t heard of this before, but I would like to try it with almond milk. 🙂 I can’t tolerate rice well (food allergy) and wonder if eating it this way would help. Thanks for the idea! They are out today. They are pricey but a little goes a long way. My husband and I are missionary teachers in Germany, and the local grocery store sells “Milchreis” in plain, cinnamon and chocolate flavors. That was the first time I had had it. Looking forward to trying the homemade version! Danke! Yum! The chocolate version sounds intriguing! I have never made or heard of milk rice, but I make milk noodles, and they’re a big hit with my girls. I basically do the same thing, using extra-wide egg noodles. I don’t measure the milk, just dump a whole bag of noodles in, then fill the pot with enough milk to almost cover the noodles. I add butter and salt after the noodles are cooked. And I use skim milk, because it’s what I always have on hand. I can’t wait to try your recipe- my oldest loves rice, so I’m sure she’ll love this! I know my my kids would love milk noodles – I’ll have to try them for sure! Had this all the time growing up! We called it Rice and Raisins because we added brown sugar and raisins to sweeten the pot. Still have it sometimes for supper on a Sunday night as a treat. I was told that this may be a Dutch treat…I’m Dutch so I’ll go along with it! Can’t go wrong unless you forget to keep an eye on it. Scorched milk isn’t fun nor is the stove it got all over! You’re so right about keeping an eye on it. 🙂 NOT fun to clean up! I grew up in the Philippines and I remember that on rare occasions that we get fresh milk (I think it’s goat milk), we mix milk with steaming hot rice then add a dash of salt. I think this would have a similar result to your “milk rice” only the rice is cooked ahead. Also the next closes thing to this would be plain rice congee. This doesn’t have milk but the method of cooking is the same. This is one of very common food in India and is specifically served to small children – cooked rice with warm milk and pinch of salt. It is easy on small child’s or sick adult’s tummy and it is yummy too! Indians also make sweet rice pudding. There is one more recipe that uses yogurt – heat 1-2 tsp butter or ghee, add cumin or mustard seeds, few curry leaves, 1 chilli or powder if you like, pinch of asafoetida (optional) and let it sizzle. Then add cooked rice, pinch of salt and stir in plain yogurt. Mix well and serve it hot or cold. Thanks for sharing all this awesome info! The yogurt version of rice sounds amazing too. I’m from the Philippines too. A savory version of this is like arroz caldo- instead of milk, 4 cups chicken broth with salt and pepper. Now I make it more like cream of chicken soup with rice. I make it in the slow cooker on low overnight. Then in the morning add shredded chicken and a can of cream of chicken soup or homemade white sauce. Let it cook on low or warm til lunch, if we can wait til then. I really like the sweet rice version too. We used to eat it with cocoa powder and powdered milk and call it champurado. We grew up on this too. We call it Dutch smooshy rice. We cook ours in a double-boiler with water in the bottom pan. In the top pan with use 2 cups milk, 1 cup water, 1 cup rice and a pinch of salt. We ALWAYS top with brown sugar and cinnamon. We also eat it with kabasa meat. I think my hubby thought we were the only family out there too. This post made me smile. We’ve eaten it as a side with kabasa too. Yum! Love the name you call it! I’m Puerto Rican and we ate this a lot. We call it arroz con leche which translates to rice with milk. Our version is more of soup… Same ingredients. I like to add a teaspoon of sugar but I make sure it has a good balance between the sweet and salty. If your version is bland then I suggest adding a tad more salt. This is major comfort food. I give this to the girls when they have upset tummies. While I’ve never heard of it being called anything, I used to take left-over rice and make it similar to this but added sugar. Satisfied my sweet tooth and usually called it Breakfast! Yes, I grew up eating milk rice. My mom used left over rice. We would eat it a dessert with cinnamon sugar sprinkled over it. I’ve asked my mom several times for the recipe, but it’s something she just makes without a recipe, so now I have a recipe. Thank you. Generations of my Texas German family have made this sweet rice like this but I have a hard time doing it. I’ll have to try again. It’s a family favorite. I made this on Sat night along with our beer in a can chicken. Very tasty. My mom wanted to put sugar and brown butter in it. She says that is how her mom used to make it. I grew up with a dish like this. The only difference was that we added a spoonful of brown sugar. It was my dad ‘s favorite dish as a child. We make this and sweeten it and eat it for breakfast! Delicious! I grew up eating it. We made rice with milk and water. We ate it for breakfast with butter and sugar. When it was for dinner we added butter and salt. I love it for breakfast. A favorite Lenten meal growing up that was delicious (and cheap!) was rice with browned butter. Basically it was milk rice with a little sugar and cinnamon dressed with butter browned but not burned, giving it a nutty flavor. One of my missed childhood memories! In Germany they sell a short round type of rice as ‘milchreis’. We cook it with sugar and add cinnamon, applesauce or any other fruit. Yes! My hubby is asian, his Mom would put raw cocoa, sugar and put extra to the side with the rice, instead of regular milk, coconut milk, and bam you have a great dessert after the side dish! It’s very kid friendly and budget friendly! I haven’t been able to have dairy since I was a baby and my son is the same way. I’ve made coconut milk before but has anyone tried it with a less sweet milk replacement? On another note we used to have white rice with most of the meals when I was a small kid. Then we’d have the leftover as dessert with real maple syrup and cinnamon on top. To this day syrup and leftover rice is one of my favorites. My mother would make milk rice for us when we were sick. I’ve never heard of adding sugar before today. It is one of my favorite comfort foods. This is a common dish for desert in Germany. We eat it with a mix of sugar and cinnamon or with a berry medley. Even today you can find this on the desert menu of fine restaurants. It’s delicious and one of my favorites! funny…it’s what’s for breakfast this very morning. My mom fixed this all the time with fried chicken. Thanks for reminding me. I’m going to introduce my husband to it. Great comfort food! I grew up eating milk rice for breakfast almost every morning. I thought I was the only family that ate it. Mom would always add a little sugar to give it a sweet taste. I now live in Brazil and have many families here eating it. I thought my family was the only people in the world who are this lol we call it breakfast wife. Here in the south (NC) that’s the way we eat our rice and we eat it with fried sausage or country ham for breakfast, or with country style steak and gravy or chicken for dinner and supper. My polish Grandmother made this all the time. We had this for dinner, not as a side. I never made it, but I want to. So I am looking for a recipe. We always added sugar on top and cinnamon. Great comfort food. Haven’t tried the recipe yet. My mom made milk rice for dinner. We put boysenberries, cinnamon, milk and sugar. It was all we ate for the meal. This is what we eat on Christmas Eve! Norweigian Rice Mush!! We have this every Christmas morning served with butter and cinnamon and sugar it’s the best!? I make this, with sugar and call it sugar rice. We ate this all the time. We call it “milk you rice”. We are it for breakfast, with fried chicken or fried pork chops. It looks a lot like what Mom used to make. We called it Salt and Pepper rice. We would put salt and pepper on it when it was served. We called it Baked Rice and it was considered a dish of our Norwegian heritage (which basically means 19th century Norwegian peasant food). My mother used a can of evaporated milk, then kept adding milk as it baked. It was served with milk, cinnamon, and sugar and paired with summer sausage. The combination of this thick, sweet, cinnamon rice with the salty, tangy summer sausage is one of the great flavor pairings of all time. My mom used to make this. She used marshmallow cream and it was to die for. Cannot find this recipe anywhere. Seems like most people responding ate this as a sweet dish. My mom made this as a savory dish the way Brigette posted it. Lol. We didn’t call it “milk rice” just rice. I didn’t know until I was a teenager that this wasn’t how everyone ate rice. Sometimes I’ll just made it just for myself. It’s real comfort food for me.